A photography session with your newborn is so much more than just taking pictures – it’s a way of capturing one of the most magical and wondrous times in your baby’s new life. Since newborns are delicate and a session should ideally take place not long after birth, it’s important to be prepared physically and mentally to ensure your little one shines on camera. Here are just a few tips to help you get ready for a newborn photography session. Photo shoots for newborns are typically held in just the first few precious weeks after your bundle of joy arrives, so booking in advance is important in order to save time and avoid stress. Most newborn photography sessions are held when the baby is less than two weeks old, ideally between five days and one week. 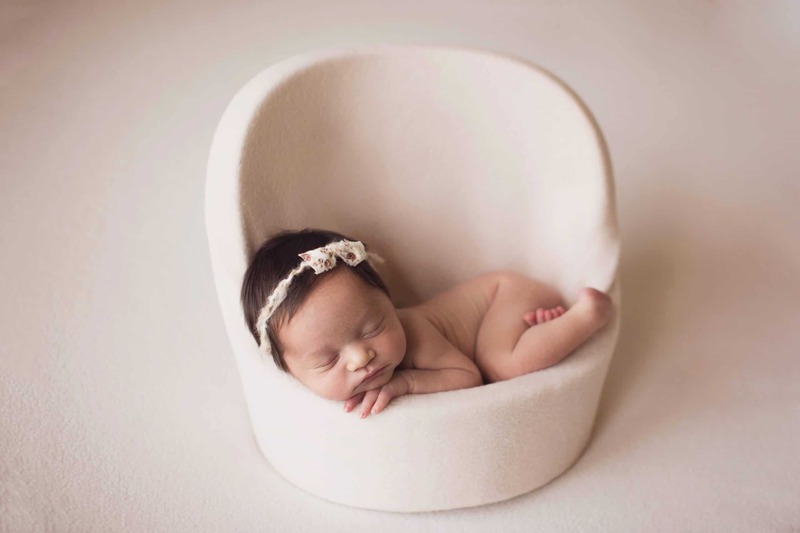 Newborns younger than two weeks have an easier time falling into deep sleeps than older babies and are a little more flexible, making them easier to pose and much more likely to sit still for longer periods of time. Additionally, things like colic and infant acne tend to appear after two weeks, so having a shoot before that time can help to minimize the amount of retouching needed. View portfolios, read online reviews, and talk to other parents who have experience with your photographer. Photographers with a large body of work and years of experience are your best bet, as photographing newborns can be a tricky endeavor and you’ll want someone with a proven track record. Trusting your photographer is key to having a successful photo session, which is something Silver Bee Photography understands after over a decade of professional experience. If there are any specific creative ideas you have about your newborn’s photography session, be sure to discuss them in advance with your photographer. You’ll want to get on the same page beforehand in order to ensure the session goes smoothly and – most importantly – you get the photos you want. Consider any poses, props, or outfits you want to be featured in your newborn’s photos. Of course, the best outfit for a newborn is no outfit at all, as most parents prefer the simplicity and beauty of their baby’s own skin to shine through without any distractions. But of course, simple items like special blankets, wraps, or headbands can help to emphasize your baby’s natural cuteness! Get creative! Not everything you dream up may be possible with your newborn, but your photographer will work hard to ensure your creative visions are brought to life in one way or another. Additionally, if you want anyone else featured in your newborn’s pictures, like older siblings or other family members, consult with your photographer and make sure the participants understand their role in the process and are prepared in advance for the big day. Don’t forget to coordinate outfits beforehand, too! The best things to wear are pattern-less and neutral colors, and if you’re unsure of what to wear, ask your photographer for advice. After your session is booked, you’ve come to a creative accord with your photographer, you’ve mentally prepared in the weeks and days leading up to the shoot, so it’s finally time to loosen up! That is to say, on the day of the shoot, make sure any diapers, hats, or accessories your newborn is wearing aren’t tight enough to leave imprints on their precious skin. Most pictures will be taken when your tiny bundle of joy is in the buff, so the purpose of loosening diapers and such is to avoid the red marks that come from pressure on your baby’s skin for extended periods of time. Loosening your baby’s diaper and clothes around a half an hour prior to the start of the shoot should be enough time for any pressure marks to fade. Another important day-of tip: make sure your baby is fed and sleepy before the session begins, to maximize comfort and pose-ability. Photo sessions with newborns can be stressful, but fortunately, there’s quite a lot that can be done to minimize or eliminate stress. The first step is to be mindful of your own emotions throughout the entire process. A skilled photographer will have the experience and know-how to make the entire shoot happen as smoothly as possible, but sometimes things don’t go according to plan. Bumps in the process are unavoidable, like all the bumps you’ll come to know and overcome during your time as a parent, so it’s important to push forward. If you’re getting frustrated, take a few moments to calm yourself with deep breaths – you can even step out of the room if you have to. Accept your frustration in the moment, and then allow yourself to move past it. Babies are incredibly perceptive and can sense tension in a room, so it’s imperative that you do your best to stay calm. In fact, taking the time to pamper yourself a little may be worth it before the photo shoot, in order to both relieve stress and look your best in case you want to be in any of the pictures. And of course, if you were planning to go to the photo shoot alone with your baby, consider instead taking someone else along who you can trust in stressful situations, whether it’s a close friend, your spouse, or another family member. Ultimately, a little forethought and some mindfulness can help you and your baby feel calmer. A newborn photography session can be everything from fun and joyous to emotional and complicated, but ultimately all parents will find that the entire process is very worth it in the end, especially if they’re in the care of an experienced photographer. Silver Bee Photography is familiar with the intricacies of newborn photography and wants to help you capture these first tender moments of your baby’s life. Whether you’re ready to book your session or you just have a few questions, contact Hillarry here at Silver Bee Photography to learn more.